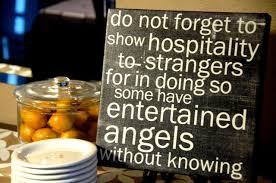 Do not neglect hospitality, because through it some have entertained angels without knowing it. Let me humble myself and serve those less fortunate. Let me be an example to others of the respect we must have for one another. Categories: devotions, god | Tags: angels among us, help the poor, hospitality | Permalink.